All we see around us are the elements of the environment. However, air, water, and soil are some of the main elements. But they are going to be a threat to our life because of pollution. There are many reasons for it. 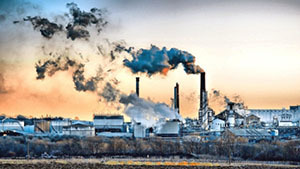 Firstly, The smoke of mills and factories is responsible for air pollution. Chemical fertilizer and insecticides, industrial waste, unsafe drains, and insanitary latrines are also responsible for water pollution. Besides, throwing waste here and there, cutting trees cause environment pollution. There are many bad impacts of environmental pollution. Environmental pollution increases the temperature of the earth. That causes the Greenhouse effect and ecological imbalance. As a result, it brings about natural disasters frequently. Air and water pollution spoils our fresh nature and spreads various diseases. It makes our life unhealthy and boring. At present, the problem is going out of control day by day. At first, the government should come forward to solve the problem. We must save our environment for a healthy life. Mills and factories should not throw chemical and waste into the water. Water vehicles should not dump oil, food waste and human waste into the river. We must not build insanitary latrines on the river bank. We have to plant trees to save air. We should realize the bad consequence of environmental pollution. Public awareness should be created. Mass media can play an important role to create public awareness. Now is the best time to raise a slogan, “Save the environment, save the lives.” Actually, our united and sincere steps can solve the problem easily. First, learn what the environment is and how it is becoming polluted, what are the effects and how we can solve it. Then you can write any paragraph on your own by following the paragraph format. What are the effects of environmental pollution? Environmental pollution increases the temperature of the earth. That causes the Greenhouse effect and ecological imbalance. As a result, it brings about natural disasters frequently. Air and water pollution spoils our fresh nature and spreads various diseases. It makes our life unhealthy and boring. How can we minimize or solve environment pollution? We must save our environment for a healthy life. Mills and factories should not throw chemical and waste into the water. Water vehicles should not dump oil, food waste and human waste into the river. We must not build insanitary latrines on the river bank. We have to plant trees to save air. Hello sir. I need a proper English suggestion for S.S.C. 2019. Can you please make a paragraph on "Your Favorite Personality" (public figure)? ?